The Marlborough bedroom range is a high quality collection of pieces crafted from solid American oak finished with a beautiful waxed finish. The four drawer chest has a classic look, fitting perfectly into a variety of bedrooms. This Marlborough 4 drawer chest provides your bedroom with practical storage space and added surface space. The 4 wide drawers provide you with plenty of storage space for all of your folded clothes. The large surface top are is ideal for displaying ornaments, photographs or even a lamp. Question from Brian: Asked on 15/06/2018 Do you deliver to the Channel Islands? Question from Carol Moore: Asked on 01/08/2014 Hi, Please could you tell me what the drawer bases and runners are made of for the Julian Bowen Marlborough range of bedroom furniture. Are the drawer bases solid wood? Are the drawer runners metal fixed on to the sides, or wooden? 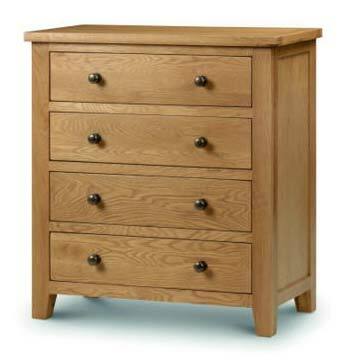 The Marlborough is a lovely strong, solid range and the drawers are made from thick plywood with smooth wooden runners.